WW1 Swedish Mauser rifle Bayonet 13" knife markings on the handle are l I27 No 1144 and on the sheath 8 T 7 vo. 376. Base of blade is marked EJ anchor AB and opposite side of base of blade is crown 194. Has a blued knurled grip. The hollow cylindrical grip slides over the cleaning rod and the locking mechanism attaches to a lug on the front barrel band. Double edged high quality blade designed to fit 1896 Swedish Mauser Rifle. Designed in functionality to present day. Looking for a couple of big hefty knives? Look no further. The Negrito Bolo Knife has "PAKISTAN" etched on one side and shows signs of wear. It has a wooden handle that and comes in a brown leather sheath. The Pakistan Bowie knife has "Negrito Bolo" etched on one side. It has a carved wooden handle and comes with a dark brown leather sheath. Both sheaths shows signs of use. 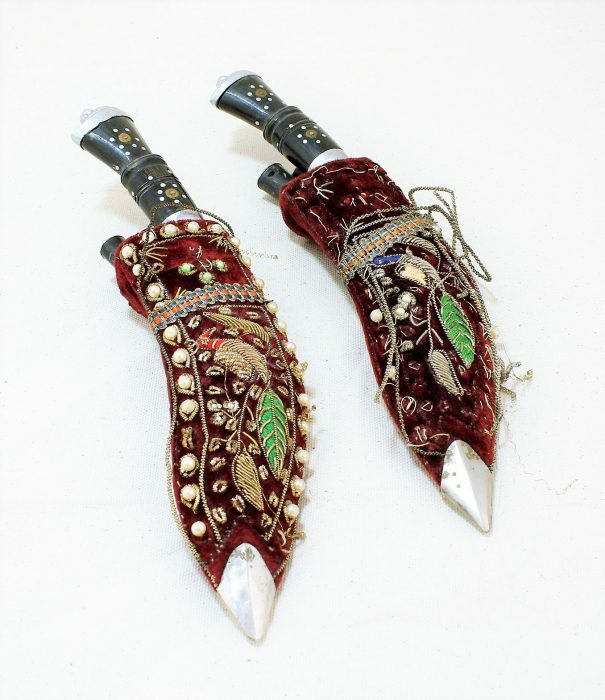 These decorative daggers each have a velvet case with 2 little knives. The knives are 9" and the smaller blades are 6" and 2". The decorative sheaths are a little worn. Some of the stitching has come loose on the sheaths. The knives have a pretty etching design on along with "India" being etched on the blades. Vintage Gurkha Kukri fighting knife with sheath. Beautiful piece of vintage. Does have some surface rust and damage to the sheath (Please see pictures). Comes as is. 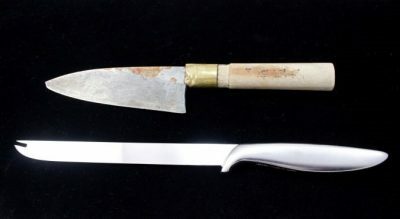 Vintage Gerber little snick carving knife has a stainless blade and a chrome handle. Has a 8" blade. Vintage Japanese Hibachi knife has Japan stamped on the blade with some Japanese writing below it and some markings on the wooden handle. The blade has some rust on it and the handle is missing a piece that goes around it up by the blade.